Yong tau foo (also spelled yong tao foo, yong tau fu, yong tau hu or yong tofu; yentafo in Thailand) is a Hakka Chinese cuisine consisting primarily of tofu that has been filled with either a ground meat mixture or fish paste (surimi). Variation of this food include vegetables and mushrooms stuffed with ground meat or surimi. 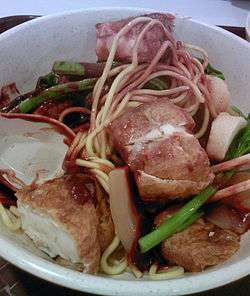 Yong tau foo is eaten in numerous ways, either dry with a sauce or served as a soup dish.